An exploration of the gifts and challenges of being part of two or more religious traditions at the same time. The world sees religious and spiritual identity as pure, static, and singular, but some people regularly cross religious boundaries. These "spiritually fluid" people celebrate complex religious bonds, and in the process they blur social categories, evoke prejudice, and complicate religious communities. Their presence sparks questions: How and why do people become spiritually fluid? Are they just confused or unable to commit? How do we make sense of them? Already, one-third of US marriages are interfaith and nearly one-third of Americans report worshiping in more than one religious tradition. In the past decade scholars have become increasingly interested in the phenomenon of complex religious bonds. But they frame it primarily as a choice, asking: "Is it possible?" and "Is it right?" For some people, being spiritually fluid is indeed a choice, but for most, it's about relationships, culture, and a response to colonialism, migration, and family history. 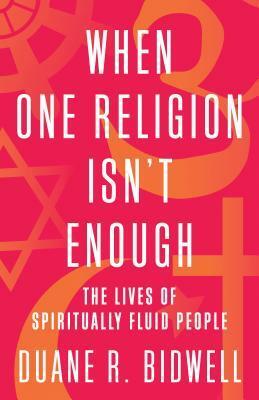 Through in-depth conversations with five spiritually fluid people, When One Religion Isn't Enough explores how people come to claim multiple religious traditions, how spiritually fluid people engage radically opposed truth claims, and what religious multiplicity means for religion and spirituality today.